It´s always interesting to see what other people wear at the fashion-shows. So i took a couple of pictures to show you some examples. For those who have only got a standing invitation, there can be quite a lot of waiting time before the show starts – you can almost see it in their eyes: “please let us in”! But once everyone are inside and the show starts – the waiting time was completely worth it! Of cause those with an invitation to sit in one of the rows are getting in first….but today at Vivianne Westwood show not everyone got in despite their invitation! The check up was so strict that, if you had forgotten your Identity cart and could not prove that it was your name on the invitation, you would not be allowed access! Normally those with an invitation will be able to attend the show – I guess this was an exception. 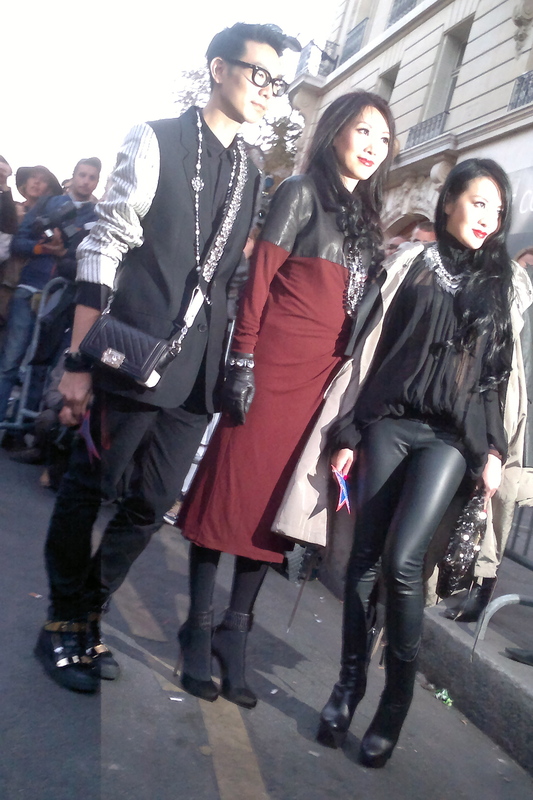 Later outside the Jean Paul Gaultier show people had crowed in order to see the celebrities arrive. They had been waiting for hours – especially all the photographers – in hope of getting some good shoots!